от 300 шт. — 75.70 руб. 160 руб. 2-3 недели, 900 шт. 5 шт. 5 шт. 175 руб. 3-4 недели, 3000 шт. 1 шт. 1 шт. 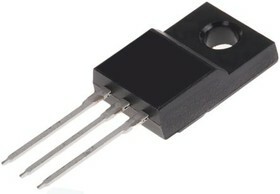 A range of high-voltage power MOSFETs from STMicroelecronics. With their low gate charge and excellent output capacitance characteristics, the MDmesh M2 series are perfect for use in resonant-type switching supplies (LLC converters).